With little surprise and perhaps even less fanfare, Republicans rode a wave of discontent to the doorsteps of the US Capitol, capturing a majority in both houses of the US Congress for the first time since 2008. To their credit, the Republican leadership has (at least initially) sounded a conciliatory tone, pausing the rhetoric of rollback to focus on the hard task of governing. Will it mean anything for Latin America? The recent wrangle over immigration notwithstanding, Latin America once again seems to be far from leaders’ minds. Yet even with all eyes trained on domestic policy and the two-front war against the Islamic State, there are three small steps the incoming Congress can take to improve relations with Latin America. The first is on immigration. The Hispanic vote has tacked heavily towards the Democratic camp in recent elections, put off by Republicans’ rejection of comprehensive immigration reform. But Republicans have historically been the amicable towards immigration. For example, it was President Reagan’s 1986 pardon that paved the way for over three million undocumented migrants to obtain citizenship. How Republican lawmakers under the leadership of Senator Mitch McConnell (R-KY) react to President Obama’s expected executive order to provide new rights this year– such as protection from deportation and work permits to migrants with significant ties to the US– could offer a glimpse into the prospects of immigration reform through 2016. A more comprehensive overhaul could improve Latin American leaders’ disposition to the US, recalling efforts by Presidents George W. Bush and his Mexican counterpart Vicente Fox (2000-2006) to strike a comprehensive deal on immigration. This would be a natural extension of the current North American energy boom. While Latin American crude exports have long helped the US cover its own energy deficit, the success of the shale revolution in boosting oil and gas production in the US and has created a new opportunity for dialogue. A Republican-led Congress could pressure the Obama administration to give the long-awaited green light to construction of the Keystone XL pipeline connecting the oil sands of Alberta to refineries on the US Gulf Coast. While the pipeline could displace up to 830,000 barrels per-day of US oil imports from Latin America in the short term, it also could be the first step in creating an integrated energy market between the United States, Canada, and Mexico. A third step would be improved an improved approach on security. 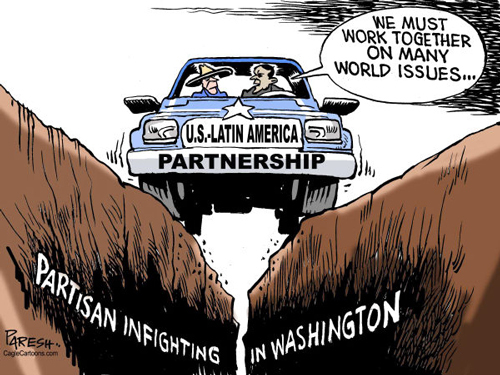 To make real gains, congressional leaders must be willing to listen to Latin American heads of state who rightly believe that US demand is a central driver of the drug trade. Since 2005, an increasing share of US security spending in the hemisphere has focused on non-military aid, something Latin American leaders have welcomed. The US has worked with the Colombian government to launch an innovative program to demobilize and reintegrate former paramilitaries and militants, while in Mexico, US legal experts have helped the country develop the technical capacity to introduce jury trials, increasing the accountability of the legal system as a whole. After a decade of strong growth and political transformation, Latin America is too complex for a one size fits all foreign policy. By focusing on synergies in immigration, energy, and citizen security, the incoming Congress can maximize diplomatic resources that in all likelihood will continue to remain limited. Kareem Yakub is a former legislative aide in the US Senate specializing in foreign affairs, trade, and banking. Kareem is currently a political risk consultant and has worked with with McLarty Associates and MannattJones Global Strategies, where he focused on political and economic developments in the Americas. This entry was posted in Andean Region, Mexico + Central America and tagged Colombia, drug, immigration, Keystone pipeline, Latin America, Latin America blog, Mexico, Obama, reform, republican congress, United States, us, US foreign policy. Bookmark the permalink.